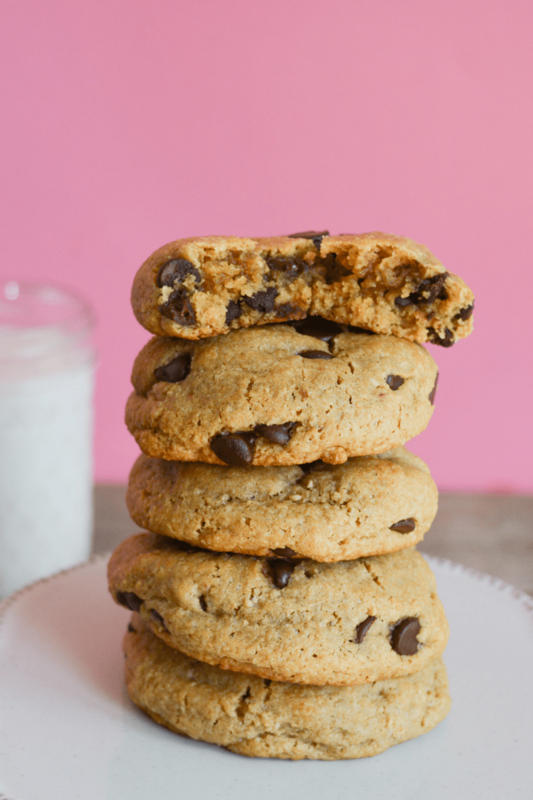 These Keto Peanut Butter Chocolate Chip Cookies are the ultimate gooey, chewy and deliciously rich low carb dessert! 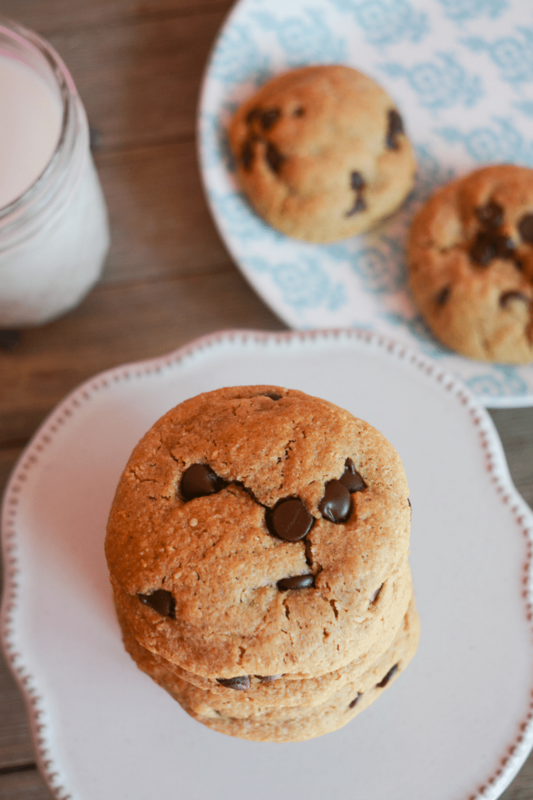 You might want to wash them with a cold glass of unsweetened almond milk! 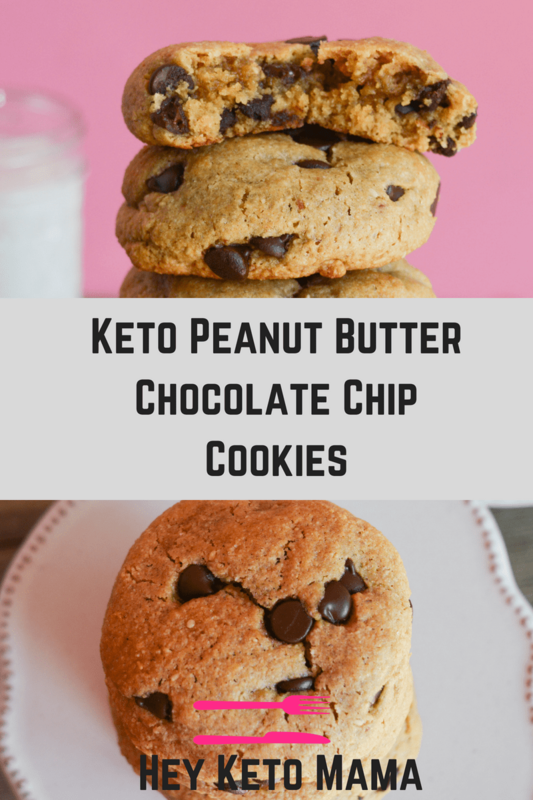 Cookies are one of my all time favorite Keto treats. They’re the perfect dessert for when you really just need some sweet low carb, high fat goodness. 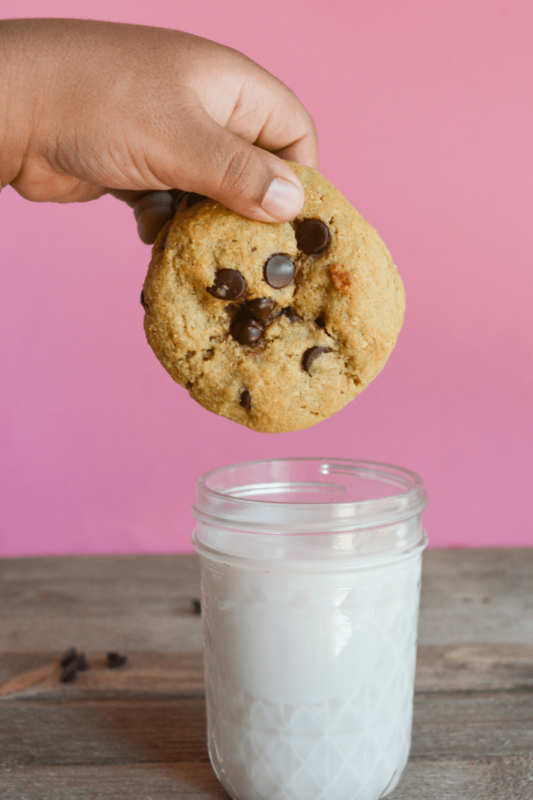 I’ve always been more of a crunchy cookie lover, and if you are too, you definitely need to check out my recipe for chocolate chip pecan and coconut cookies, but if you’re here for gooey cookie amazingness keep on reading! Joe was testing peanut butter cookies this morning and struck absolute gold….so much so that we knew we had to get this recipe up on the blog ASAP! I know Peanut Butter is a bit controversial on a ketogenic diet, but if you use an unsweetened, natural peanut butter (maximum 2 ingredients: peanuts and salt) you’ll find that the carbs are very reasonable. For instance, in this recipe we only use 2 tablespoons of peanut butter, which only amounts to 4 net carbs. If it’s still not your jam, feel free to use an alternate butter like almond butter. 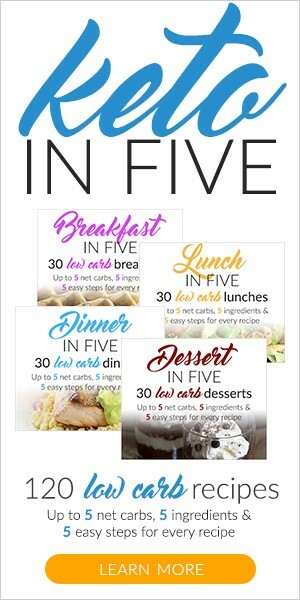 For one serving (1 cookie) we’re looking at 5 net carbs. I love how big and gooey the cookies come out when you separate the batter into 8 cookies. To reduce the carbs even more, simply roll the dough into smaller cookies. I think this dough could easily make 12 smaller cookies. In a separate bowl mix almond flour, baking powder, baking soda, and salt until well combined. Bake for 15 minutes at 350 degrees. Allow cookies to cool completely before digging in! We made these cookies with both the new Brown Swerve and Regular Granular Swerve. The Brown Swerve gives the flavor more depth, and is definitely the preferred taste, but the Regular is also very delicious. I had about 3 tablespoons of butter left from a stick so I threw it all in, upped the pb the same then added 1/2 cup of coconut flour to get the consistency right for rolling into balls. I also added a 1/2 tsp of vanilla. I made 20 smaller cookies and they were fantastic! Thanks for the recipe! Hi! This looks amazing! Have you frozen the dough? I’m looking to make it, and then to freeze the dough balls, so I can add the chocolate and bake off as desired. 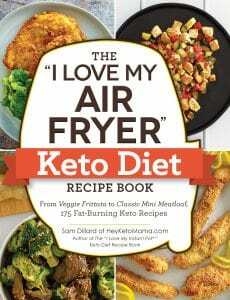 I have never frozen something with either erythritol or almond flour, so I’m curious how they would do! Any guidance is appreciated! I made these today and followed the directions but they don’t look anything like yours! They spread out on the baking pan, got really thin and got burnt along the edges. Any idea what I did wrong? They were delicious! The whole family loved them! Big and fluffy!! Omg!!!!! Yes!!!! 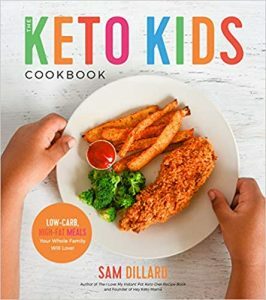 This is a great receipe. I rolled them in a ball and put them in muffin tin. They taste like a mini muffin. Delicious!!! Can you use the peanut butter powder that they sell in the stores now. I wouldn’t, just because I think the actual peanut butter is essential to the dough. That said, I haven’t tried it, so I could be wrong! you could probably just add water to the pb powder until it’s the consistency of normal pb. So so yummy! I have also made these chocolate-chocolate chip by adding 2 TBS of unsweetened cocoa powder. DELISH I make these almost weekly as a healthy snack that satisfies the sweet tooth without sacrificing the carbs! Thanks for the recipe! Do we have to use baking Soda? Or is only baking powder good? These were delicious cookies. Can I switch sweeteners to coconut sugar or Monks fruit sweetener? What would the amount be? You can definitely switch up the sweetener, but I’m not sure what the amounts would be. I’d assume it would be similar, but you might want to play around with it and taste the batter as you go. I personally do not taste cooling but I like erythritol a lot. It’s the only sweetener I use. If you like stevia, maybe a blend of stevia and erythritol such as Pyure might be a good option to try. The erythitol cuts the bitterness from the stevia and the stevia helps make the cooling less noticeable. I use Lakanto golden. It measures the same but I don’t think it has that cooling taste. I made these in a mini muffin pan, taking only 8 mins. Yummy! These are the BEST keto cookies I have made. I used almond butter instead of peanut butter and the consistency was PERFECT!!!! Wonderful cookies but now I know that I need to mash the balls down with a fork before baking. For chocolate chips I broke a up 90% chocolate bar into pieces. Nice hitter chocolate goes well with peanut butter. I just made these about 30 minutes ago. My cookies needed to be mashed down as well. Wonder if we didn’t have enough oil in our peanut butter or not enough butter. They still tasted awesome, but dry. Is it okay to use Natvia instead of Swerve? Thanks a lot. Followed directions with the following modifications: added 1/2 TBSP coconut oil, 2 oz unsweetened chocolate melted with the butter, I only used 2/3 cup almond flour, only sweetened the batter to taste slightly sweetened (I like it semi sweet, and hate what can be an overbearing taste of sweeteners in baked goods), cooked for only 8 minutes (could have been a couple minutes less to get a more chewy consistency…they were more cake like, but have a grainy consistency from the almond flour). Came out better than expected, but are dry. I like them enough to try again and will bake a little less to try to maintain moisture, and maybe try even less almond flour than the 2/3 I used. I have tried so many “cookie/brownie” recipes where I have wasted ingredients because I’ve thrown the results away. This is the first time I actually kept the result and will prepare it again! All in all a very good base to work with. Do I melt the butter to just room temperature or do I microwave it to totally melted? Do you use Super Fine Almond Flour and Large egg or Medium? Thank you! My tasted awful. I used the regular Swerve becuz I didn’t have the brown sugar kind. Not sweet enough. I just baked these, the dough was kinda runny-but I’m at altitude and used to having to add a little more flour. I added a little more almond flour until the dough was a bit stiffer and I’m glad I did. Baked for the recommended time and they look soft, but they’re nice and golden on the outside. They definitely smell good! Can’t wait for them to cool so we can dig in!